Plan transportation to and from the port. Whether it be by car, plane, taxi, uber, train, horseback, you name it! Plan ahead of time so you're not scrambling to get there. Plan excursions ahead of time. If you plan ahead you can save some money because prices for excursions through the ship will increase. If you plan it on your own you can save even more, you just have to find your own way around. The one convenient thing about booking excursions through the ship is that they basically take care of everything for you. Also we realized that 1 excursion a day is enough and plan it early in the day so that you have the rest of the day to explore or relax. Going with a big group is more fun. 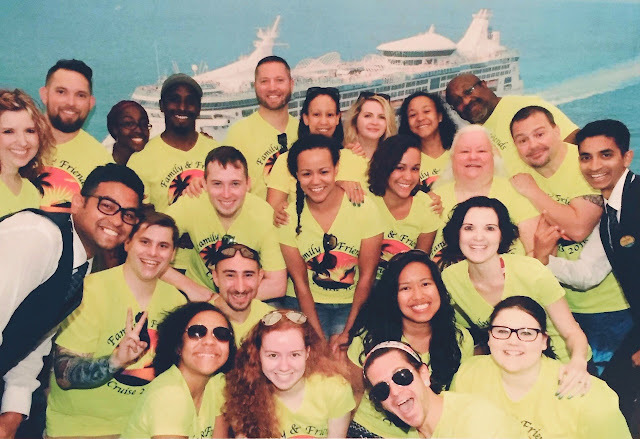 If you are traveling with a big group wear matching colors or create custom cruise shirts to help identify everyone in the group (especially when boarding together). Plan time off plus 1 day after returning. If you're trip is done correctly, you'll need time to catch up on sleep and to actually relax. Enough clothes with a few extras. Here's what I brought for our four night cruise: 4-5 bathing suits and about two outfits per day, plus 2 extra outfits. I thought maybe it would be like hotels where they give you the mini-sized bottles of shampoo and conditioner but that's not the case. So to be sure bring your own shampoo, conditioner, body wash, etc. But the ship will provide you with plenty of towels in fun animal shapes! A beach bag or backpack. Although you don't have to bring your own towel because the ship will provide you with one, it's good to have a beach bag or backpack to hold it so you're not carrying the towel around yourself. Plenty of one dollar bills for tips. Even with a drink package it's always good to have extra ones on hand for tipping your bartenders. Plenty of sunscreen and aloe and apply vigorously. You don't realize how much stronger the sun's rays are and the fact that you're enjoying your time on the beach. If you forget, try to wait until you are at a port to buy it rather than on the ship. Try getting the lotion kind of sunscreen rather than the spray kind. Especially if it's windy, a good percentage of that spray sunscreen will not land on your skin. Your passport and boarding passes. And anything else needed to board the ship. It's also a good idea to bring or buy a lanyard for your Seapass or other Cruise card you will get. Pack or wear your bathing suit as you board the ship. Your luggage will be carried on separately and delivered to your room. It may take all night for the luggage to get there so also be sure to tip your luggage guy. Might make your stuff move faster! You can get some great photos or videos without worries about getting it wet. We brought our GoPro while snorkeling and our friend had an underwater camera that took fantastic pictures! Put your phone on "airplane" mode or just shut it off completely. I used my phone as a camera and watch only and the effects of being disconnected were incredible. We actually had to plan times to meet and "knock" on each others cabin doors to get in touch with one another. You don't realize how dependent you've become to your phone until you can't use the wifi. Check out the daily activity pamphlets they give you each day. Sometimes you can find "free" things or fun activities or shows to watch. And don't be afraid to put yourself out there! 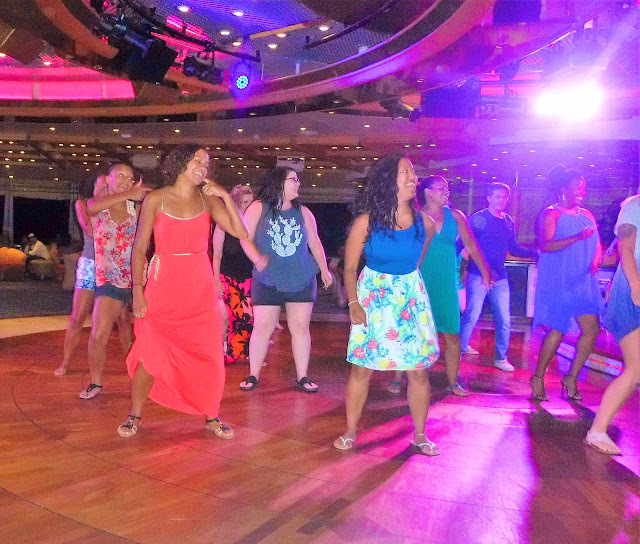 The games are so fun and there is plenty of music, dancing, and karaoke aboard the ship. Take advantage of the ships activities. Zach and I were chosen to participate in a "Love and Marriage" game show which is basically like the NewlyWed Gameshow. Pretty embarrassing questions but all in good fun! We even got a copy of the recording of the show! Get plenty of rest, stay hydrated, and beware of motion sicknesses. You don't want to exhaust yourself or get yourself sick on the cruise so stay hydrated and try not stay up all night. Usually sailing on the ship is pretty smooth but you never know when the ship may encounter rough waters. Definitely learned this the hard way the first night, but after that I made sure to take motion sickness pills first thing in the every morning to prevent it. Haggle at the "markets" at the port. They know you're a tourist so they will try to get the most money out of you. Try going way lower than what they are asking from you. Take plenty of pictures and videos. Pictures can capture the best moments that you will treasure for a lifetime. Dress up for the Captain's dinner. It was actually really fun to dress up for one night to go to dinner. Go on and be fancy for once! Of course you'll be visiting beaches but beware of the the pool deck! It can be pretty toasty on your feet. Romantic and perfect on the top deck. Meet one of the many hermit crabs we encountered. Never thought I'd see one outside of the souvenir shop. 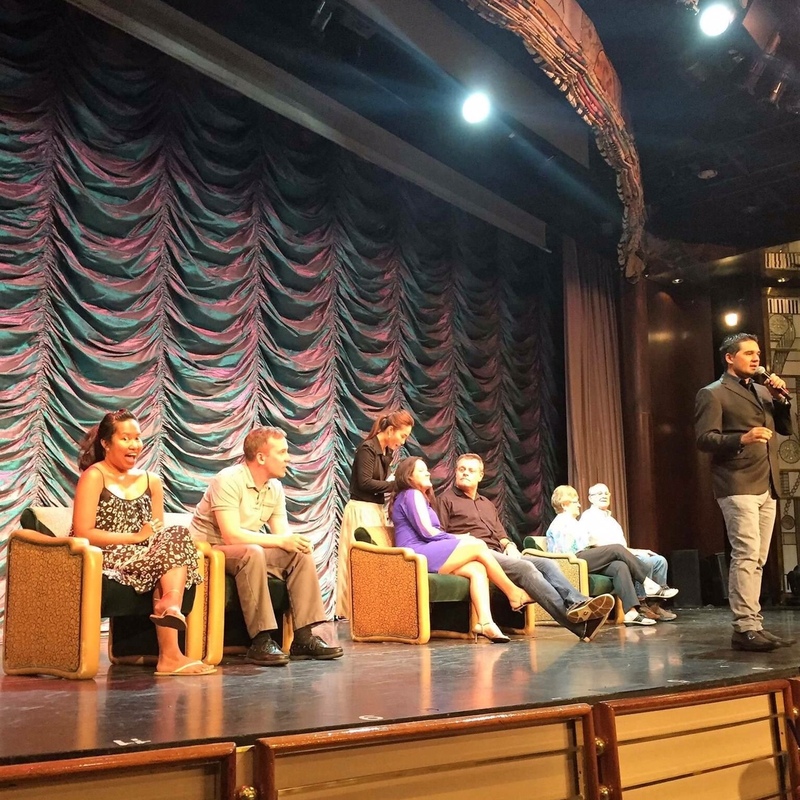 After this experience, I can't wait to go back on my next cruise adventure! 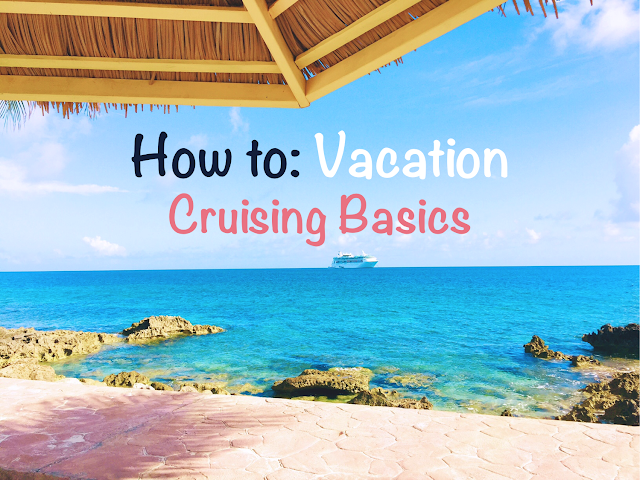 Share any cruising basics of your own in the comments below! I'm a fan of cruising and loved this post. I cannot wait to plan our next cruise (our last cruise was this March). I know we can't wait either! I definitely feeling the post-cruise blues.